Our exclusive setting out service offers bespoke interior design in Marlow and across Buckinghamshire, Berkshire and Surrey and we make sure we tailor each project to our clients’ specific tastes and personalities. Hotel style is a much-coveted area of interior design when it comes to bathrooms and bedrooms, conjuring up luxurious weekends away with your partner and bringing a feel of exclusivity to your home. For developers, creating bespoke bedrooms influenced by chic hotel style can be a useful selling point and add an element of luxury to your project. So, how to create hotel style in your bedroom interior design? Well, here are just a few ideas to get you started – come and visit us at Concept Virtual Design to talk over your wishes and requirements for your bedroom interior design and we’ll help you to come up with a perfectly unique plan! Make a focal point of your bed – after all, what else is a bedroom for? Hotel style means overdressing your bed with linens, bedspreads, cushions and sumptuous throws and blankets. Oversized headboards and statement walls behind beds are a fantastic trend and can be achieved using tiling, wallpaper, fabric, artwork and mirrors. Use bold patterns, rich plains and crisp neutrals – hotel style is understated but utilises statement patterns and designs to contrast against high-quality neutrals and plains. Consider a bold wallpaper with a calming tone of paint, or patterned bed linens against bright white sheets. Add interest and light with reflective surfaces – texture and reflective surfaces help to bring extra light into your bedroom as well as adding a fantastic element of unique design. Go beyond mirrored surfaces and choose reflective wallpaper or textured luxury tiles. Go for fitted furniture and bespoke wardrobes – it’s worth investing in furniture that fits perfectly in your bedroom, especially when it comes to bookshelves, wardrobes and clothes storage. 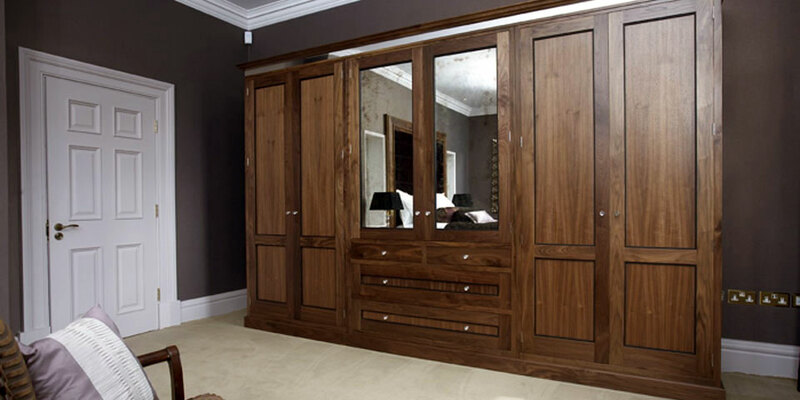 Bespoke wardrobes allow you to choose different compartments and sections that suit your needs perfectly. Make a centrepiece of your favourite furniture – relax in a comfy armchair or lounge in a luxurious chaise and make a centrepiece of beautiful furniture. 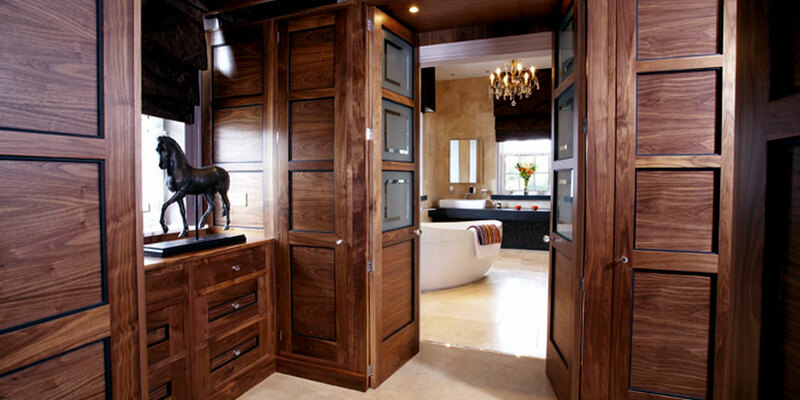 Seating areas and dressing tables definitely belong in the bedroom, providing a space to relax and unwind. Aim for symmetry and simplicity – simple is always best when it comes to luxury design. If you have high quality fittings and fixtures, and an adaptable foundation for your interior design, you can customise your bedroom with decorative items, splashes of colour, mood-enhancing lighting and striking artwork. Choose the best quality where it counts – you can afford to invest in luxurious rugs, carpets, or sleek wooden flooring in your bedroom as it’s the one room in your house that has the least foot traffic. You could even go for underfloor heating for a truly cosy design. Similarly, your window dressings aren’t something you replace very often so it’s worth opting for high quality blinds or curtains that will last. And, of course, your bed is the most important element of any bedroom, so make sure it’s as comfortable as possible. 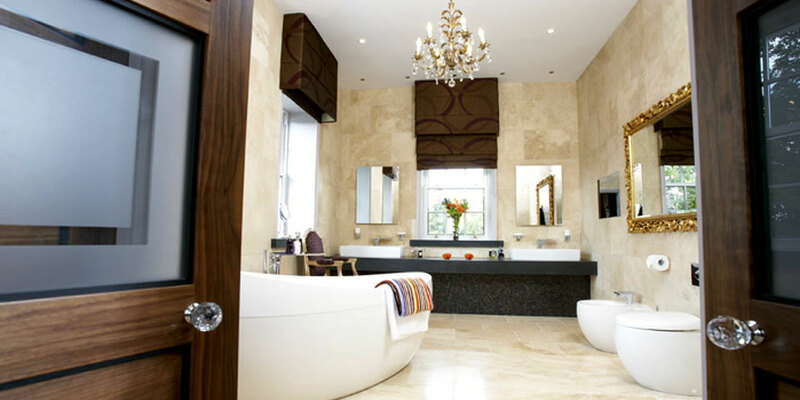 Link your bedroom design with your bathroom – whether you have an en-suite, master bathroom, shower room or wet room, join your interior design together and incorporate similar elements in both your bedroom and your bathroom area. This brings a sense of cohesion, especially in a development project. For more advice and ideas on hotel style bedrooms and any aspect of luxury interior design, please get in touch with us at Concept Virtual Design. We have a showroom in Maidenhead and cover the whole Berkshire, Buckinghamshire and Surrey area. This entry was posted in A3 Colour Design Service, Luxury Interior Design, Wardrobe and tagged bedroom design marlow, bespoke bedroom interior design service buckinghamshire, exclusive interior design marlow, hotel style bedroom design, interior design marlow, luxury interior design. Bookmark the permalink.